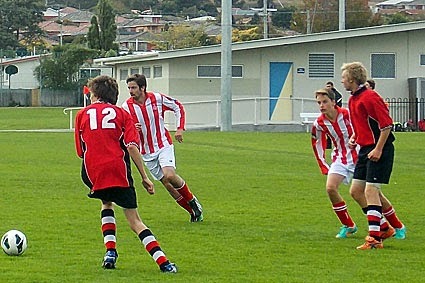 New Norfolk's James White (12) looks to kick the ball forward. Park last Saturday. The locals play at Tynwald Park tomorrow. THE recently formed New Norfolk senior soccer side lost to Barnstoneworth Scrappers 7-3 in their Division 4 clash at Wentworth Park, Howrah, last Saturday. Goal scorers for New Norfolk were Josh Young, Tom Shepherd and Brodie Gleeson on debut. "Despite the loss, the team showed their skill on the ball with an improved second half performance," coach Colin Banks said. 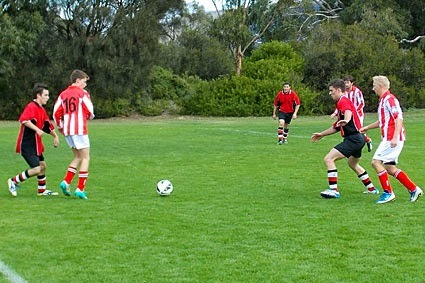 The next match is a home game versus South Hobart at 12.30 tomorrow (Sunday) at Tynwald Park. Spectators most welcome. Thanks to Wade Gleeson for the photos. Junior and youth teams are having a break over the school holidays but games will resume on May 9.